Muay Thai translated into English as Thaiboxing, is the national sport of Thailand and is a martial art with origins in the ancient battlefield tactics of the Siamese (or Thai) army. It evolved from Krabi-Krabong, literally sword and baton, hand-to-hand tactics of the Thai army. The early Muay Thai bouts pitted different companies within the Siamese army against each other with few rules and no weight divisions or time limits. They became quite popular and eventually shown in stadia across the country. In the early 20th century, time limits, boxing gloves as well as a uniform set of rules were introduced. During the latter half of the 20th century Muay Thai was exported to many countries and is now practised by hundreds of thousands of people all over the world. 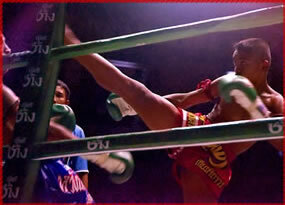 Muay Thai is known as “King of the Ring” in kickboxing circles. These fights feature punches, kicks, elbows, knees and standing grappling to wear down and knock out the opponent. Thai training methods develop devastating power, speed and superb cardio-vascular endurance as well as fighting spirit. Muay Thai training is also quite safe thanks to sophisticated pad training that evolved to keep fighters healthy between fights. Muay Thai has also proven very effective outside the ring and has been embraced enthusiastically by practitioners in a variety of self-defence, sporting, military and law enforcement activities. The Wai Kru (respects to the teacher) also known as Ram Muay (boxing dance) is an important part of any evening watching Thai boxing. These are ceremonies which are performed before each Muay Thai bout. Sometimes the Wai Kru are brief and basic, but other times they may be eloquent performances that draw praise and applause from the crowd. It is said that those who see well can determine who will win the fight by watching two fighters perform their Wai Kru. Teachers are highly respected in Thai society and many artistic disciplines, not just Muay Thai, perform Wai Kru or “respects to the teacher”. Foreigners viewing these rituals should take care to be polite and not act disrespectfully regarding the Wai Kru. The Thais take seriously any insult to the Wai Kru, just as you would if somebody insulted your spiritual beliefs. Before the competition of Muay Thai, Krabi-Krabong (Thai swords), or any other ancient weapons martial arts, every competitor must perform the Wai Kru ritual and perform the boxing dance which is the continued tradition since ancient times. Wai Kru is a way to pay respect to his majesty the king or the chairman of the competition tournament. Furthermore Wai Kru is the way to realize the goodness of the master who gave them the knowledge. It is also the way to create strength of the mind. The style of the dance is unique to each boxing bureau. Boxers who danced the same style wouldn’t fight each other since they realize that they have the same master. Furthermore, to dance is one way to warm up before starting the fight. It also helps to relax the fighter and to prepare the mind and body to go into battle. Muay Thai started way back in the medieval ages when wars were fought with bows and arrows, swords and pikes. And in hand-to-hand combat arms, legs, knees and elbows were also used as weapons. This sport which was included in military training was made famous by King Nareusan 1560 A.D. During one of the many battles between Burma and Siam he was captured. The Burmese knew of his prowess as the best unarmed fighter in the realm and gave him a chance to fight with their best for his freedom. Upon his return to Siam he was hailed as a hero and Siamese-style boxing, as it was called then, was soon recognized as a national sport. Boxing in this style reached its zenith of popularity about 200 years ago, i.e. the reign of Prachao Sua (King Tiger), when it was indulged in by all classes of the population. From those days up until the early part of this century, the fighters particularly those in provinces, used horsehide strips and later help in lieu of gloves. It was also a practise at one time to grind pieces of glass into the help if both contestants agreed. Since these practises were obviously dangerous to the fighters’ health, regular boxing gloves were introduced about 50 years ago and have been used ever since. 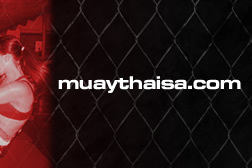 To the Thais, Muay Thai is regarded as a prestigious national sport. Thai boys will in one or another way, intentionally or unintentionally, learn how to box Thai style. Even Thai girls will know enough of the basic principles and be able to use it for self-defence when necessary. Muay Thai is now becoming more popular in many countries especially in Japan where a large number of young Japanese are now being trained to fight professionally. But in Japan this fighting is called “Kick Boxing”. At present “Kick Boxing” is internationally known as a Japanese martial art. Surely the true name, “Muay Thai” should be retained internationally as the Japanese terms Kendo, Judo or Karate have been. There is no (clear) evidence to show the time of origin of Thai-style boxing. It can only be assumed that Thai boxing existed since the Thai emigrated from the South of China. The Thai immigrants had to hide from attackers and met with resistance from local people. In short they had to fight endlessly for their own survival. By the time they managed to settle in the “Gold Promontory”, the Thais had gone through countless battles and many lives had been lost. The ancient weapons consisted only of spears, swords, pikes or bows and arrows. But in hand-to-hand combat weapons become clumsy, and elbows, knees, feet and fists became more practical. This must have been extremely successful, as it was then developed into a form of martial arts used in battle, and this was the origin of Muay Thai.